Eastern State Penitentiary - resembling a Gothic castle - at 21st Street and Fairmount Avenue. Photo taken by the publisher. For 2010, Eastern State Penitentiary has added some new options, such as "Fright and a Bite" Dinner Packages with a Quick Pass to bypass the lines, for its extremely popular Halloween show and tour, Terror Behind the Walls. For a complete schedule and ticket information, take a look at our new Terror Behind the Walls Page - while haunted houses aren't our taste in entertainment, personally, a lot of people like that stuff, so take a look at our page in order to plan your visit to Terror Behind the Walls. Eastern State Penitentiary resembles a fortress in enemy territory, awing the visitor - and that design was not by accident. The goals of its 19th-century architect were dual. The first goal of the prison was to insulate inmates from the corrupting influences of the outside world that had spawned them. But the second goal - no less important to its designer - was to make an emphatic statement, of the omnipotence of the justice system - and not just to the inmates who called it home. It was also intended to serve as a reminder to the citizens at large, of the consequences of committing crimes. Ironically, given its sinister look and architecture, its original design simultaneously reflects the most enlightened thinking of its age. Prior to Eastern State Penitentiary's opening in 1829, there was a widespread belief, that prisoners could not be rehabilitated and returned to society. For that reason, one of the major innovations of the prison was to assert the belief that a prisoner could, in fact, repent and return as a law-abiding member of society at large. Accordingly, the prison was constructed around the rule of solitary confinement. It was believed that immersion with other criminals was one of the main sources of crimes. In marked contrast, solitary confinement would make it possible for the inmate - no longer exposed to moral infection by other inmates - to reflect upon his wrongdoings and emerge from the prison as a rehabilitated citizen. Left alone in a cell, with skylight coming in and a Bible to read, the inmate within the walls would have plenty of time to determine the root causes of his offense(s). And thus he would formulate the resolve to avoid repeating them after his release. As 21st-century Americans, we can acknowledge that the doctrine of solitary confinement, was in fact a sincere attempt by prison reformers, to improve the plight of prison inmates. But the good intentions of the reformers had an entirely unanticipated consequence. Namely, that solitary confinement drove the inmates to madness. And in some ways, solitary confinement was even worse, than the vile prisons that predated Eastern State Penitentiary and its many (300+, in fact) offspring throughout the world. But nobody realized that, back in 1829. Lafayette returned to Philadelphia half a century after the Revolutionary War, as the last member of the generation which had won the war. His visit revived interest in the period and helped prevent the Pennsylvania State House - what we now know as Independence Hall - from being demolished. During his returning, rock star-esque tour of America in 1826, he found time to visit Eastern State Penitentiary, as it was being built. It indicates how proud Philadelphians were of the project, that it should be shown off to visiting, high-profile dignitaries such as Lafayette. Eastern State Penitentiary also was the temporary home of two of the most famous criminals in American history - Al Capone and Willie Sutton. Capone's lavish, carpeted cell can be seen when you visit. Sutton, the notorious bank robber, managed to escape the mighty fortress, and you can also see the area of the prison from which he did so (although he was later recaptured). The castle-like prison remained in active use, for its original purpose, for a remarkably long period - nearly 150 years. The final straw that determined its closure took place in 1961, 132 years after it opened. In that year, the worst riot in prison history took place, and its most long-lasting consequence was to ultimately shutter the prison. Four years later, in 1965, Eastern State Penitentiary was designated as a National Historic landmark by the federal government. And in January 1970, it was officially closed, with its inmates transferred to other prisons. The city used it temporarily once more in 1971, after a riot in Holmesburg Prison, but that was its final use as an active prison. For the next two decades, Eastern State Penitentiary was virtually abandoned as a ruin, although there were various suggestions as to what ought to be done with the fortress in Fairmount. Finally, in 1991 - two decades after its closure - it was decided - ironically - that it should be rehabilitated- just like its inmates. Its historic value had already been recognized formally, since 1965. Accordingly, Eastern State Penitentiary would be converted into a historic site, and rendered suitable for visitors and tours. In 1994, after a three-year renovation, it was once more opened to the public. But for the first time in 165 years, the vast majority of people going inside were doing so voluntarily (and enthusiastically). Happily, the attempt to rehabilitate Eastern State Penitentiary itself was far more successful, than those of its inmates. In an outstanding example of urban ingenuity and planning, a once-dangerous, problematic building was successfully transformed into one of Philadelphia's most popular tourist attractions. It has injected even more life into the Fairmount/Art Museum area, which was already a vibrant and exciting neighborhood. Travel to Eastern State can be complicated, due to the fact that it is located in primarily a residential neighbor and off the beaten path for visitors to Philadelphia. Accordingly, in order to determine which way(s) of travel are best for you, please consult our guide to getting to Eastern State - How to Travel to the Prison Fortress. For the most in-depth information, you can consult the very sophisticated official web site of Eastern State Penitentiary. Every day, 10 AM to 5 PM. It is closed only on Christmas Eve, Christmas Day, Thanksgiving Day, and New Year's Day. Note: Children under 7 are not permitted to enter Eastern State at all, presumably due to the fact that - in Eastern State's own description - the prison is in "semi-ruin". Occasionally, we get a question about "visiting Holmesburg Prison", as it is completely understandable that it can be easily confused with Eastern State. Like Eastern State, Holmesburg Prison was also constructed in the 19th century (1896), closed in the late 20th century (1995), and had a sinister reputation. Also, Holmesburg has been in the news occasionally, as several Hollywood productions have used it as a film set, most recently in 2009. However - unlike Eastern State - Holmesburg is still occasionally used as a functioning prison, is located in the distant Northeast Philadelphia neighborhood of Holmesburg, far from tourist territory. Most importantly, it is not open to the public for tours. So don't confuse Eastern State with Holmesburg - they are not the same! When he founded Pennsylvania, William Penn and the Quakers wished to find an alternative to the corporal - and frequently capital - punishment, meted out to criminals for their crimes. And this was during the late 17th century, when "criminals" and "crimes" were defined far more broadly than modern, 21st-century society would even remotely tolerate, and with good reason. At the time, Penn's England could impose the death penalty for over two hundred offenses. It also could impose lesser penalties, although nonetheless horrifying, such as mutilation, or transportation to the Caribbean (which unlike modern times, was viewed not as a desirable vacation locale, but as a de facto death sentence, due to the frequent onset of incurable, tropical diseases such as malaria). Penn also had more personal reasons for prison reform - he was no stranger to prison, on a firsthand basis. Despite his aristocratic and wealthy background, he had been imprisoned in England on multiple occasions, due to his advocacy of Quaker doctrines and beliefs (and in at least one instance, due to a deliberate act of civil disobedience). So Pennsylvania's new criminal code stipulated capital punishment for only one crime - murder. It also introduced imprisonment, as well as sentences of labor and fines, for criminal offenses. Although the new Quaker-inspired code still had severities which we would find horrific today, it was a considerable improvement over what Penn had inherited from England. As these reforms seemed to provide a much more humane alternative, they were instituted in Penn's new utopia. The city's first prison was known as the Old Stone Prison, at 3rd and Market Streets in Old City. In practice, Old Stone was not working out as planned. Prisoners were overcrowded, and it was described succinctly as "a sink of wickedness." The site, located at 6th and Walnut Streets, became known as the Walnut Street Prison, and the Assembly - in addition to the prime real estate - engaged the services of the city's best master builder, Robert Smith, to design it. Clearly, the new prison was considered a major capital project, fully funded by the colony of Pennsylvania. 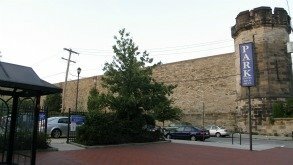 Unfortunately, and ironically, the Walnut Street Prison was finished in time for the British to make use of it, during the American Revolution, for their inhumane treatment of American prisoners of war, during their occupation of Philadelphia, from September 1777 to June 1778. After the war ended in 1783, Walnut Street Prison remained a hellhole. The conditions were so appalling, that it spawned a society - in which Benjamin Franklin was involved - called the Society for Alleviating the Miseries of Public Prisons. Since Walnut Street Prison was failing in its mission, the Society managed to persuade the legislature to appropriate funds for new, cutting-edge penitentiaries at each end of the state - in 1818, Western State Penitentiary was built in Allegheny County (now Pittsburgh) and Eastern State Penitentiary was constructed in 1821. The site of Eastern State was originally a pleasant cherry orchard, and the new prison was thus known - in a remarkable euphemism - simply as Cherry Hill (although it should not be confused with the modern, affluent New Jersey suburb, with the same name). It was designed by the architect John Haviland, who selected the Gothic style that he described as "Anglo Norman." The commissioners who funded the project made the message they wanted to send very clear: it "should exhibit as much as possible great strength and convey to the mind a cheerless blank indicative of the misery which awaits the unhappy being who enters within its walls." Source: Roger W. Moss, Historic Landmarks of Philadelphia, 2008.